Mutts come in all shapes and sizes. Mutt Photos Pages. If you want to find out exactly what is in your dogs mix there are canine DNA tests available. Widely varies. One way to determine what a mutt's traits may be like is to look at what kind of dogs the parents are. There are many different types of dogs, from guards, hunters, herders and sighthounds to those bred only to be companions. When you have a mixed breed you can have a combination of a lot of different traits. Although it may help you in some ways, it is not super important that you know exactly what breeds are in your dog's mix. 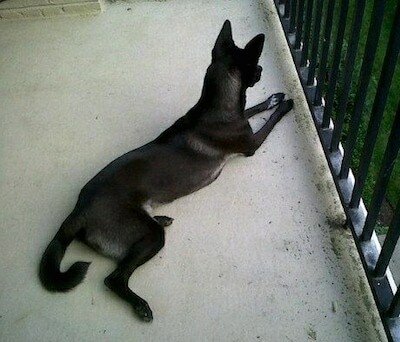 What is very important is that you understand what the dog as the canine animal needs. Dogs are pack animals that thrive on structure and knowing exactly where they fit into it. No matter what size or type of dog you own be sure to give your dog plenty of clear rules and leadership in its daily life. Learn how the canine animal thinks, the differences between humans and canines and how to properly communicate with him, providing the proper amount and type of exercise. Challenge your dogs mind through tricks or play. If you are thinking about adopting a rescue dog please read, Successfully Adopting a Rescue Dog. Taking the time to learn natural dog behavior and giving your dog what he instinctually needs as that animal will be the difference between your success and your failure with your canine pet. Widely varies, although often mutts are generally healthier than purebred dogs, simply because the lines are wider spread. Widely varies. It is best to look at what kind of dogs the parents are. Energy levels widely vary from dog to dog. One thing that does not vary, however, is all dogs have a migration instinct that humans must fulfill in order for the dog to be stable minded. Read the Proper way to walk your dog. Widely varies, although all dogs will benefit from at least an occasional brushing. Ears should be checked on a regular basis and the nails should be kept short. Originally it was thought that dogs came from a cross between the jackal or jackal / wolf. Scientists now believe that dogs first originated in Eurasia between 12,000-14,000 year ago, from a smaller southern strain of Gray Wolf called Canis lupus pallipes that can still be found in India today. Although called the "gray wolf," the coat comes in a wide variety of coat colors. It was distributed throughout Europe, North America and Asia. Some other possible ancestors of the dog include the woolly wolf of North India and Tibet, and the desert wolf of the Middle East. It is known for certain that all domestic dogs first originated from one or a combination of these sources. The domestic dog is not genetically connected with any other species. From the beginning of the Bronze Age, circa 4500 BC, five distinct types of dog have been identified from fossil remains. Among them were Mastiff, wolf-like dogs, Greyhounds, Pointer-type and Sheepdogs. These basic types proliferated by natural genetic mutation and selective breeding produced the approximately 400 different types of dog breeds we know today. "Purebred" dogs are a group of dogs that look alike and are the product of parents with a similar appearance and which, when mated together, reproduce their kind. 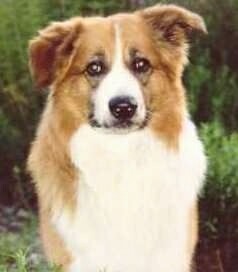 A mongrel or mutt is a dog whose parents are unknown or is not considered to be purebred. Tonka the DNA tested 50% Golden Retriever 25% Aussie and 25% Siberian Husky mix at 5 years old—"Tonka is a product of grandma's dog and grand-daughter's dog spending vacation together. Neither family knew the other dog wasn't fixed. Even tho she is 50% Golden Retriever, most people think she's a Black Lab (especially in the summer when she has her summer "cut" - too hot in TX for the Husky in her), until we show them her beautiful "feathered" tail. "Tonka is the smartest dog I've ever had. Even smarter than the wolf-hybrid I had years ago. One night I said "double N" to my husband in regards to Tonka's dinner (double n) time. She turned and gave me the "look", "yes, it's dinner time and you're late". Never before had I used "double N" as code for dinner. "Everything is Tonka's "favorite" thing. We keep her healthy with very good dry dog food, plain yogurt (daily with her morning feeding) and half of a raw lamb shank on Sunday. She will tell me when it's time for lamb and she knows I keep it in the microwave (so she can't steal it off the counter)." "This is my puppy Boma. She looks like a Basenji mix and the more I get to know her and the more I learn about dogs, I have been thinking she's mixed with a Whippet. She was a rescue so her past is a mystery—in fact, she was listed on Petfinder as being a Chihuahua / terrier mix but clearly she is neither. She's a very sweet girl, about to be 11 months old, and the more I learn about dog behavior, the better I am getting at being her leader." Update:"Boma had a DNA test done. 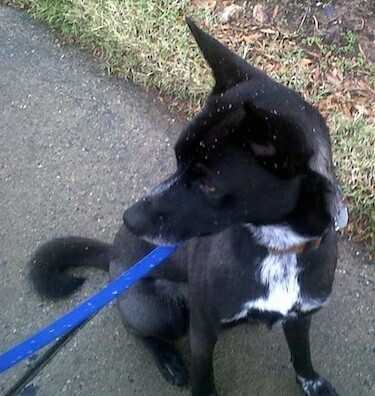 The results came back half Siberian Husky and the other half a mix of Beagle / Dachshund and Whippet / "mixed breed". When you look down into "mixed breed" it includes—Cesky Terrier, Tibetan Mastiff, Jindo, Shar-Pei, and German Shepherd. I still think she looks and acts like a Basenji. Mostly people say she looks like a fox and I think she acts more like a cat than a dog. This picture does show how she differs from a Basenji—she is so long! People tell me she looks like a Pharaoh Hound, I guess because she is so long. 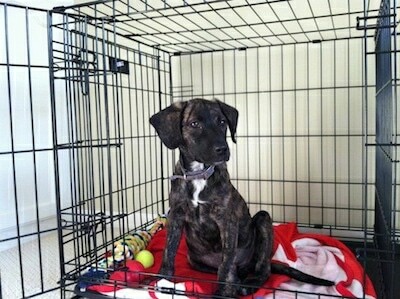 Boma's foster mom said she had two brindle brothers. 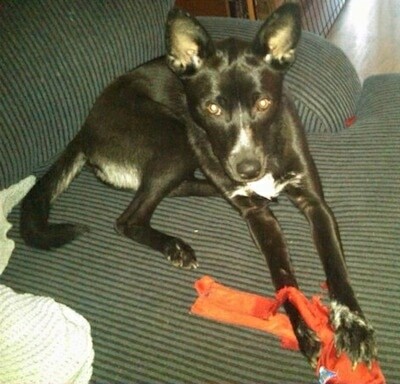 She was listed on Petfinder as a Chihuahua / terrier mix!" This handsome boy is named Cody. 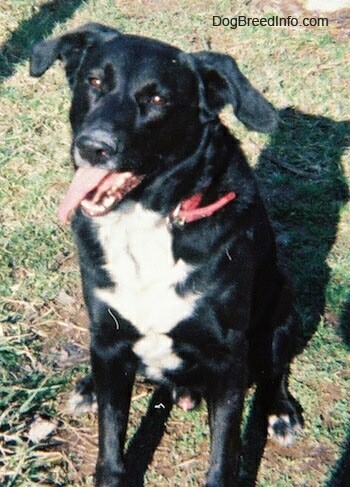 "His father was a Black Lab and his mother was a Saint Bernard mix." 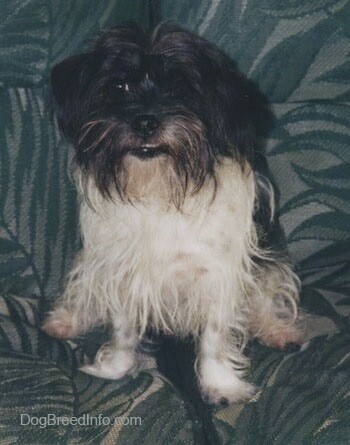 "This is Rex, my dog I had growing up. He died in 1990. 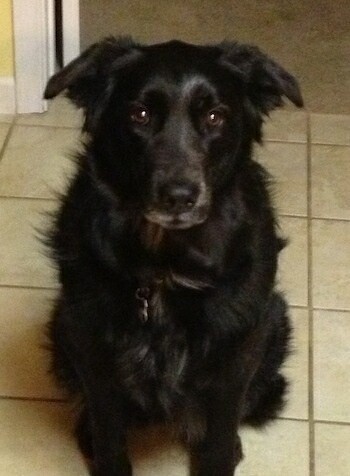 He was a Black Lab/ Collie / Shepherd mix." 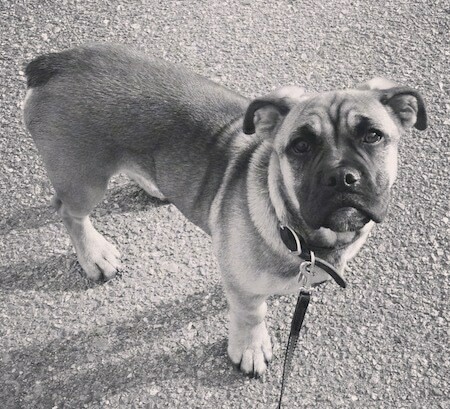 Augie the Jack Russell Terrier / Pug (Jug) / English Bulldog mix at 7 months old—"This is Augie. His birthday is Oct 22, 2013. We got him from a farm in Pennsylvania. His mom was a Jack Russell Terrier / Pug mix who was about 21 pounds and his dad was an English Bulldog who was about 50 pounds. He weighs 27 pounds at 7.5 months. He loves water and he's very hyper despite lots of running and exercise. He rarely barks." "Two-year-old Lab / Redbone Coonhound cross who can't figure out whether she is supposed to bay or bark." "We found Amstel at our local Humane Society and she weighs about 14 pounds in this picture. She was found by animal control with her mom, hiding under a car. We have no idea what she is mixed with so we are uncertain how big she will get. She is the calmest, sweetest little girl, and we can't get enough of her!! She loves to cuddle and follow us all around the house. 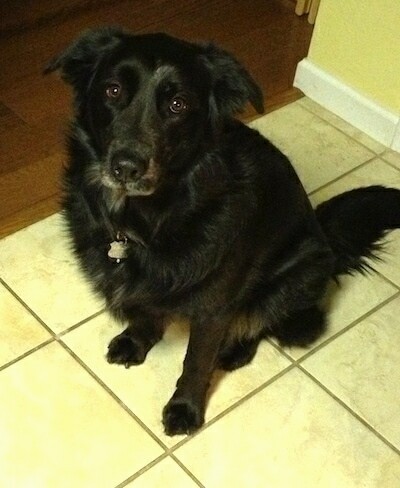 She is very observant and just watches me while I cook in the kitchen. We are using Cesar Millan's philosophy of exercise, discipline and affection to train her and we are finding it very effective! We are so happy and lucky to have her as a part of our family!!"